1 A None No Power Seat 1 A is a standard Business Class Bulkhead seat. There is no floor storage for this seat during take-off or landing. 1 C None No Power Seat 1 C is a standard Business Class Bulkhead seat. There is no floor storage for this seat during take-off or landing. 1 D None No Power Seat 1 D is a standard Business Class Bulkhead seat. There is no floor storage for this seat during take-off or landing. 1 G None No Power Seat 1 G is a standard Business Class Bulkhead seat. There is no floor storage for this seat during take-off or landing. 1 H None No Power Seat 1 H is a standard Business Class Bulkhead seat. There is no floor storage for this seat during take-off or landing. 1 K None No Power Seat 1 K is a standard Business Class Bulkhead seat. There is no floor storage for this seat during take-off or landing. 15 A None No Power Seat 15 A is a standard Economy Class seat that has extra legroom due to the exit however, the proximity to the lavatories may be bothersome. There is no floor storage at this seat during takeoff and landing. 15 C None No Power Seat 15 C is a standard Economy Class seat that has extra legroom due to the exit however, the proximity to the lavatories may be bothersome. There is no floor storage at this seat during takeoff and landing. 15 D None No Power Seat 15 D is a standard Economy Class seat that has extra legroom due to the exit however, the proximity to the lavatories may be bothersome. There is no floor storage at this seat during takeoff and landing. 15 E None No Power Seat 15 E is a standard Economy Class seat that has extra legroom due to the exit however, the proximity to the lavatories may be bothersome. There is no floor storage at this seat during takeoff and landing. 15 F None No Power Seat 15 F is a standard Economy Class seat that has extra legroom due to the exit however, the proximity to the lavatories may be bothersome. There is no floor storage at this seat during takeoff and landing. 15 G None No Power Seat 15 G is a standard Economy Class seat that has extra legroom due to the exit however, the proximity to the lavatories may be bothersome. There is no floor storage at this seat during takeoff and landing. 15 H None No Power Seat 15 H is a standard Economy Class seat that has extra legroom due to the exit however, the proximity to the lavatories may be bothersome. There is no floor storage at this seat during takeoff and landing. 15 K None No Power Seat 15 K is a standard Economy Class seat that has extra legroom due to the exit however, the proximity to the lavatories may be bothersome. There is no floor storage at this seat during takeoff and landing. 16 A None No Power Seat 16 A is a standard Economy Class seat that is missing a window. 16 K None No Power Seat 16 K is a standard Economy Class seat that is missing a window. 34 D None No Power Seat 34 D is an Economy Class seat that may not recline. The close proximity to the lavatories may be bothersome. 34 E None No Power Seat 34 E is an Economy Class seat that may not recline. The close proximity to the lavatories may be bothersome. 34 F None No Power Seat 34 F is an Economy Class seat that may not recline. The close proximity to the lavatories may be bothersome. 34 G None No Power Seat 34 G is an Economy Class seat that may not recline. The close proximity to the lavatories may be bothersome. 35 A None No Power Seat 35 A is an Economy Class seat that is missing a window and may not recline. The close proximity to the lavatories may be bothersome. 35 C None No Power Seat 35 C is an Economy Class seat that may not recline. The close proximity to the lavatories may be bothersome. 35 H None No Power Seat 35 H is an Economy Class seat that may not recline. The close proximity to the lavatories may be bothersome. 35 K None No Power Seat 35 K is an Economy Class seat that is missing a window and may not recline. The close proximity to the lavatories may be bothersome. 40 A None No Power Seat 40 A is an Economy Class seat that has extra legroom due to exit. The tray table is in the armrest, making the armrest immovable and slightly reducing seat width. There is no floor storage during take-off or landing. 40 C None No Power Seat 40 C is an Economy Class seat that has extra legroom due to exit. The tray table is in the armrest, making the armrest immovable and slightly reducing seat width. There is no floor storage during take-off or landing. 40 D None No Power Seat 40 D is an Economy Class seat with extra legroom however, the close proximity to the lavatories may be bothersome. Air Europa designates this seat as an 'XL' seat, and a added fee may be required to book this seat. The tray table is in the armrest, making the armrest immovable and slightly reducing seat width. There is no floor storage during take-off or landing. 40 E None No Power Seat 40 E is an Economy Class seat with extra legroom however, the close proximity to the lavatories may be bothersome. Air Europa designates this seat as an 'XL' seat, and a added fee may be required to book this seat. The tray table is in the armrest, making the armrest immovable and slightly reducing seat width. There is no floor storage during take-off or landing. 40 F None No Power Seat 40 F is an Economy Class seat with extra legroom however, the close proximity to the lavatories may be bothersome. Air Europa designates this seat as an 'XL' seat, and a added fee may be required to book this seat. The tray table is in the armrest, making the armrest immovable and slightly reducing seat width. There is no floor storage during take-off or landing. 40 G None No Power Seat 40 G is an Economy Class seat with extra legroom however, the close proximity to the lavatories may be bothersome. Air Europa designates this seat as an 'XL' seat, and a added fee may be required to book this seat. The tray table is in the armrest, making the armrest immovable and slightly reducing seat width. There is no floor storage during take-off or landing. 40 H None No Power Seat 40 H is an Economy Class seat that has extra legroom due to exit. The tray table is in the armrest, making the armrest immovable and slightly reducing seat width. There is no floor storage during take-off or landing. 40 K None No Power Seat 40 K is an Economy Class seat that has extra legroom due to exit. The tray table is in the armrest, making the armrest immovable and slightly reducing seat width. There is no floor storage during take-off or landing. 50 D None No Power Seat 50 D is a standard Economy Class seat however, other flyers tend to bump into this seat. 50 G None No Power Seat 50 G is a standard Economy Class seat however, other flyers tend to bump into this seat. 51 D None No Power Seat 51 D is a standard Economy Class seat that may have slightly restricted legroom due to the misalignment with the row ahead. 51 E None No Power Seat 51 E is a standard Economy Class seat that may have slightly restricted legroom due to the misalignment with the row ahead. 51 G None No Power Seat 51 G is a standard Economy Class seat that may have slightly restricted legroom due to the misalignment with the row ahead. 52 A None No Power Seat 52 A is an Economy Class seat in the last row of the plane that may not recline. The close proximity to the lavatory may be bothersome. 52 C None No Power Seat 52 C is an Economy Class seat in the last row of the plane that may not recline. The close proximity to the lavatory may be bothersome. 52 H None No Power Seat 52 H is an Economy Class seat in the last row of the plane that may not recline. The close proximity to the lavatory may be bothersome. 52 K None No Power Seat 52 K is an Economy Class seat in the last row of the plane that may not recline. The close proximity to the lavatory may be bothersome. 54 D None No Power Seat 54 D is an Economy Class seat whose close proximity to the lavatories and galleys may be bothersome. 54 E None No Power Seat 54 E is an Economy Class seat whose close proximity to the lavatories and galleys may be bothersome. 54 G None No Power Seat 54 G is an Economy Class seat whose close proximity to the lavatories and galleys may be bothersome. 55 D None No Power Seat 55 D is an Economy Class seat in the last row of the plane that may not recline. The close proximity to the lavatories and galleys may be bothersome. 55 E None No Power Seat 55 E is an Economy Class seat in the last row of the plane that may not recline. The close proximity to the lavatories and galleys may be bothersome. 55 G None No Power Seat 55 G is an Economy Class seat in the last row of the plane that may not recline. The close proximity to the lavatories and galleys may be bothersome. All Business Class seats have access to an AC power port. There is no Power in Economy. Air Europa provides WiFi on board its long-haul fleet. Air Europa flies the Airbus A330-200 with 299 seats in a two-class configuration of Business and Economy. No Entertaimentsystem, seat didn't fully recline, black box infront of my seat so not good leg room. I sat in 40A for 3 different Air Europa legs on the A330. Both 40A and 40K have emergency slide/raft equipment boxes in front of them. While most people would never hit their knees on these boxes if you want to full stretch out your legs you have to angle them to the side and slightly into the space of your neighbor. People also tend to stand in the open area while waiting for the bathrooms. The tray table and video screens are inside the middle arm rest which means it does not move up. Air Europa crew is very strict on not having anything with you or in front of you at these seats during take off and landing. No bags, pillows, blankets, etc and no using headphones for music. They will generally return your bag for you after take off. All and all it is probably worth the area cost for the space. BE VERY CAREFUL IF BOOKING THIS. 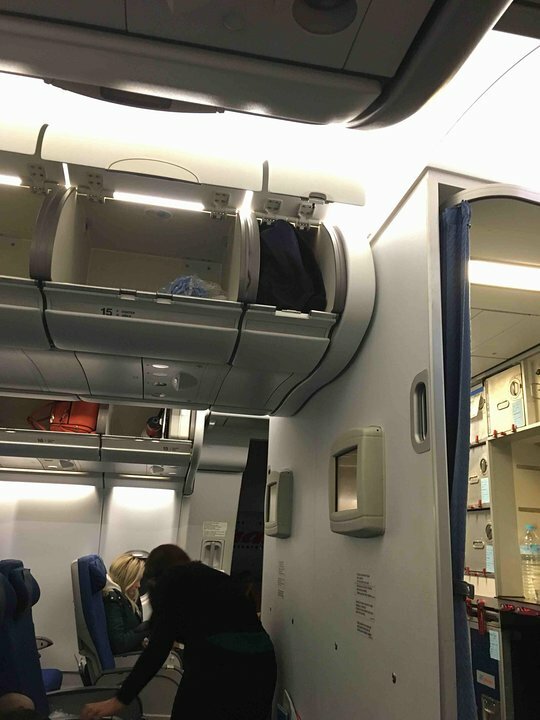 UX 91: MAD-JFK 3/19/17 There were no seat-back IFEs as stated here. only fold down LCDs every few rows that played mostly UX ads. Unacceptable in 2017. Aircraft was extremely worn and my headrest kept falling off. Food was terrible quality. Actually served saltines, pasta with red sauce. However I thought the seats had ample recline and since they were so old they had the quality and comfort of a well worn couch. I would say it's like flying Southwest transatlantic. Easily the worst Transatlantic experience I have ever had the displeasure. Will be staying away from UX in the future. The last 2 times I've flown with AirEuropa I purchased this emergency exit 15H. The good thing about it is the space, however it's near the galley and other travelers like to stand in that area so it can be quite noisy. Overall it's worth the investment. As the plane is quite old the seats and TV system is old fashioned. Also the seatbelts are attached to the seats in such a way that the metal sticks out. Also the arm rest does not go up all the way. Row 15 A and C are terrible seats, no legroom whatsoever, they are even worst than normal seats. So if you ever get "upgraded" to these exit seats run away. Also, at least for GRU-MAD-GRU the plane did not have individual screens, only those old ones that are shared. I´ts painfull to say but my body and legs where worst. The media not working, and a flight of 12 hours non stop was a torture for the legs. The personal service in land and air was surprising very kind. Seats -10, service +10, entertaiment 0 (there was none)even they sell the earphones. Food as usual in airlines nowadays. This seat is so uncomfortable it was torture could 't wait To land! The person infront of me was almost sleeling in my lap. Couldn't watch the TV because it was broke, plus the person was right in my lap so I couodn't watch anything any way. She kept trying to get comfortable by banging her seat right to me. Now I know how it would feel being in a can of sardine. 11 hours of hell!! If you are above 5' 11 you well suffer pain. The hosts do nothing to help! Whag can they do?! They can't repair the TV or make the seat confortable. Spacing between seats are acceptable but seats are uncomfortable. In my opinion the seats do not lie completely flat. You could not draw a straight line from the headrest to the foot rest at the lowest position. The seat bottom remains at a slightly different angle to the rest of the seat. Also the footrest on both my flights was poor. It raised on command with the control but sank back down as soon as I put my feet on it. The space is good but in my opinion it is a poor quality business class seat compared to other airlines. Air Europa flies 1 versions of Airbus A330-200.